Historically, yellowfin tuna have been hard to come by off Miami. Lately however, we have seen a slight resurgence of yellowfin tuna off Miami with this past 2017 being one of the best on record. In the spring, schools of large Blackfin Tuna migrate along Miami's coast and the yellowfin tuna are sometimes mixed in as well. Tuna fishing in Miami is typically a live bait fishery, where the friskiest of livies are used to fool the sharp-eyed fish into biting. Deploying live baits off of kites and in varying depths in the water column with light tackle is the best way to get in on the action. Early mornings can offer a decent bite but nothing beats tuna fishing in the evening. 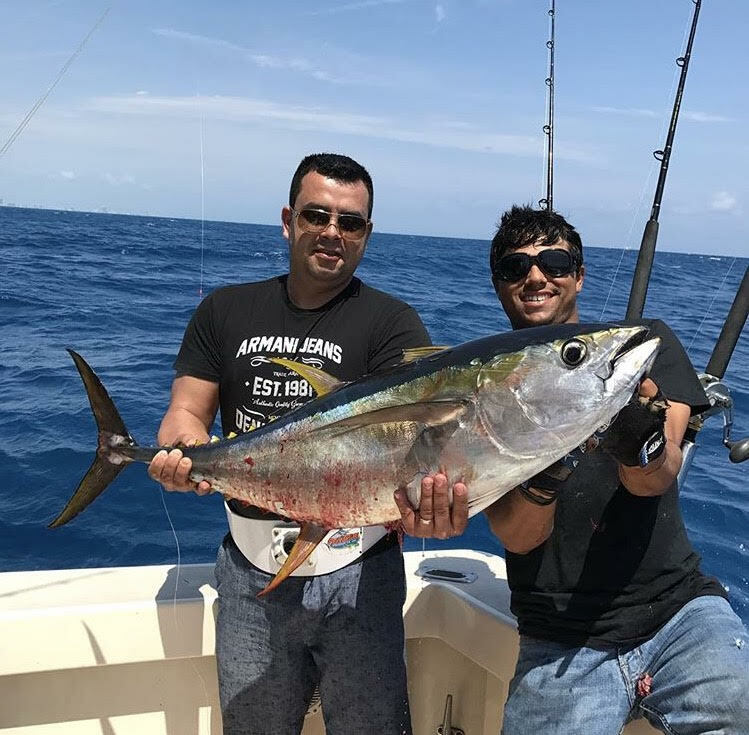 The only downside about yellowfin tuna fishing in Miami is that most of the fish are 40-80 lbs which can be very tough on light tackle. We also have the occasional shot at fish over 100 pounds which usually turns into a heartbreaker. Regardless, yellowfin are a rare but plausible species that keep things interesting while fishing off Miami. March through June is a great time of year to target yellowfin tuna in the Bahamas where they are much more common. Boats often run to Bimini, clear customs, then go fishing off the "corner" of Great Issac or near the Gingerbreads south of Freeport. Yellowfin tuna fishing in the Bahamas is very preparation intensive with the primary goal of loading up on pilchards. It's best to head to the Bahamas with a few thousand pilchards in the boat which is only enough for an afternoon or two of fishing. Fortunately, with enough live bait on board, live chumming can turn into a wide open tuna bite. All it takes is one school sometimes to put 5-10 fish in the 50-89 pound range in the boat. Contact us for Bahamas charters, we can definitely put together a custom trip.